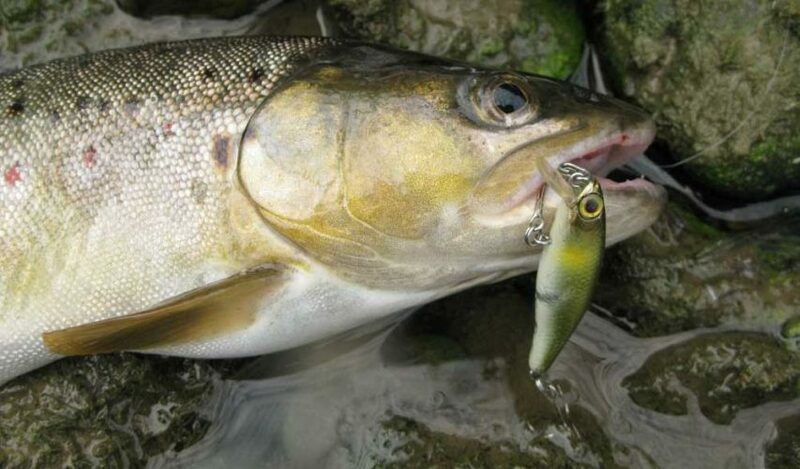 Is there anything better than watching a big trout take a bite out of a well-positioned lure? I was always a traditional trout fisherman, catching trout with worms on a float for deeper waters and lakes or a wet or dry fly for fishing rivers and streams. That was until I discovered lure fishing. I had always thought of this method of trout fishing as cheating because I wanted to present a natural looking bait to catch the fish. I fished a river many years ago in Ireland where live trout bait was banned – I had always considered maggots the best bait for trout – so in this instance only Fly or Lures were available to me. Weather was off so fly wasn’t going to cut it. Out came a brand new lure straight out of the packet. Had a few casts to figure out how to fish the trout lure and about 6 casts in this monster hit the lure and nearly ripped the rod out of my hands. The next 20 mins or so were spent coaxing the monster Rainbow Trout onto the river bank. My introduction to lure fishing for trout was with a trout spinner. Spinners are one of the easiest lures to use for catching trout and can be fished in many ways, making them versatile and suitable in almost all conditions. I love flicking a spinner into a river or a small stream and teasing out shy trout from the riverbank or from under snags. You don’t need to carry a lot of equipment with you when spinning so can cover a lot more ground. Trout spinners are designed to vibrate and attract the fish in the swim due to their bright colors and most trout find them irresistible. You fish a spinner by casting the lure into the swim and retrieve with a steady quick pace. The faster you wind in the reel the quicker and noisier the lure is. A slower retrieval will show off the lures colors a bit more but may not have the same effect on trout. My personal method is a few quick casts followed by a slower one. With this method, you are covering plenty of ground and giving yourself the best chance to catch that shy trout. If you are looking for a great all-rounder spinner for trout then the Panther Martin has to be your first choice. This lure has caught me so many fish is all different conditions and is definitely the first lure I tie on when I get to the water. It has plenty of weight for longer casts and is great in both shallow and deeper water. Trout spinning lures can be fished in small shallow streams, a river of any size and even lakes. The Panther Martin is one of the best lures for streams and can be fished in shallow fast moving water. When fishing rivers we fish them upstream and diagonally from the bank and draw the lure in at a steady pace. It will take a bit of getting used to but once you get it right that’s it. Not sure what it is about these lures but the trout cannot resist them. Drop one in front of a large rock or clump of weed in a river, start reeling and watch the trout come out from their hiding place and literally launch at the spinner. Once you hook up its game on. The key with spinning for trout is to keep moving. Don’t fish the same spot for too long and as always the first cast is the most important one – especially if you are fishing a remote river where the fish may not have seen spinner baits before. Fished on a fairly light tackle this is trout fishing at it’s very best. In case you missed it you should flatten the barbs on your hooks with pliers so they can be removed more easily from the fish. Remember though to keep plenty of tension on the line when you reel in the fish or it may slip off. If you are fishing deeper water then one of the best lures for lakes has to be the Panther Martin Spinner. You can troll with this lure or fish from the shore if suitable. 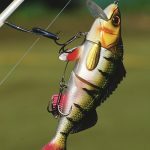 For trolling this trout lure you may want to use a three-way swivel setup with a weighted bottom line to get the lure down quick enough or maybe use a downrigger if they are in really deep water. If you are new to trout fishing and are looking for tips for river fishing and where to locate trout in a river you should check out this very handy infographic showing you where fish hide in streams. The majority of the time I fish for trout its on a river and conditions can vary dramatically. The river can be high and cloudy or Gin clear and low with overgrown weed-beds sprouting out above the surface. For fast moving water, where I want to keep the lure down into the water column I always use a Panther Martin lure. This brightly colored lure is great for trout but is also a fantastic rainbow trout lure. You can fish with any amount of different lures – and there are plenty to choose from but this little beauty works over and over again. If the fish aren’t biting then tie on one of these lures and away you go. My other go-to lure for river fishing is the Rapala original diving minnow. You can fish it shallow or force it down into the water column but simply reeling in faster. It’s also a great lure to stick on a down-rigger off the back of a small boat if the river is big enough. You can fish this lure down to 11ft in depth – just check out the sizing before you buy one. I fish a size 09 that works great up to 5 foot down into the water. Fishing small streams for trout is great sport and can be one of the most enjoyable fishing experiences out there. The thrill of the hunt in very shallow water and overgrown banks make this tough but very rewarding when you get a fish on. Trout that live in these small waterways are very shy, usually hide under or around fallen logs or weed beds and are tough to catch. If you have enough room to fire a spinner or lure into the stream then something like the Mepps Aglia or a brown or gold Panther Martin will serve you well. In our opinion, the Panther Martin is by far the best spinner for trout by a country mile. The trick to fishing streams with lures is to control the depth of the lure with the rod tip. Some of the best trout baits tend to run deep in the water but by lifting the rod tip you can adjust the height of the lure track in the water. This is ideal if you are fishing in shallow streams. When it comes to rod selection for small streams you won’t want anything bigger than a 5 ft rod because you may have to trek through heavy undergrowth to get to your fishing spot. Ideally, if you get yourself a decent telescopic rod you can store it in your pack and away you go. Line selection is pretty straightforward. Keep it around 4 – 6lb mono as these fish will be very line shy especially if the water is clear – which is the norm in faster running streams unless they are in flood. If you are trout fishing on a lake or open water and don’t have a boat then you need something that you can cast a good distance. I use the Silver/ Blue lures all the time on lakes and they have never let me down. There is nothing difficult about using one of these lures. Just tie it on and away you go. If however, you don’t feel like getting your hands dirty or are short on time then plastic worms are the next best thing – some even say they are better than the real thing. Clear water calls for natural looking worms and for this I will always use Berkley Powerbait floating worms. No mess, no fuss and deadly for trout. I am a huge fan of these worms. They are dynamite on trout and they cannot resist attacking them. I like to whacky rig them and run them about 8 inches up from a weight or bobber. They are very realistic and with the added scent the trout love them. 75mm or about 3 inches is perfect for most trout and in most conditions so stick to that. If you find you are not getting the fish to bite try dropping down to a smaller trout hook size and a shorter or chopped up worm. If like me you fish barbless hooks then a size #10 or so is perfect for this type of fishing. Check out our full review of trout hooks and get yourself set up before you head out fishing again. 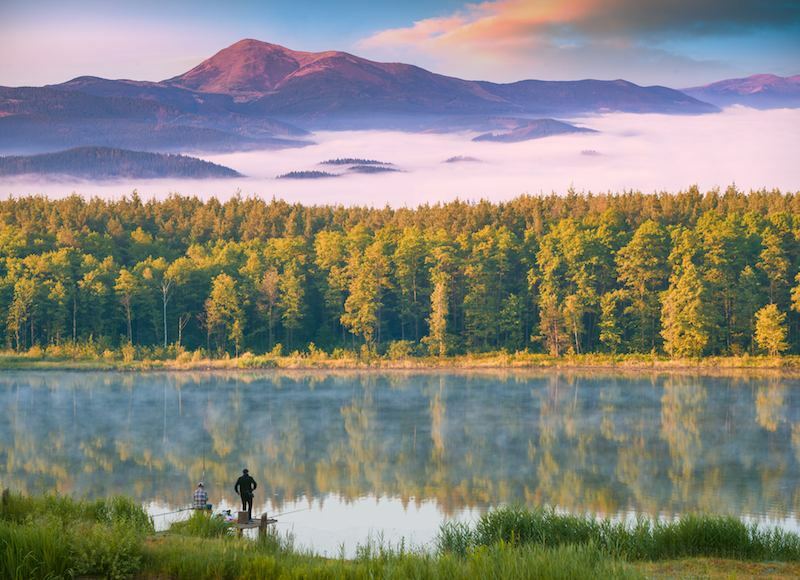 Early morning and the hours before dark are the most productive for trout fishing but you can catch trout throughout the day – depending on conditions. Color size and pattern all come into play as well so make sure you have a few options available on the day. You might have a great day’s fishing on one particular lure and the next time you go out might not even get a bite. Change lures often if this happens and keep moving up and down the river. best time to fish for trout is early morning or just before nightfall. A hungry trout will take a well-placed lure at any time of the day. Fly fishing for trout in the evening during a good hatch on the river is a great sport too and if you are fishing a dry fly it can be one of the most visual and rewarding ways to catch trout. There are many options when it comes to the color of your lures and a lot will depend on fishing conditions. Bright lures from the Mepps range are great for fishing muddy waters after a flood. If the current is really strong you might have to fish a larger spoon to keep the lure in the flow. Fish will tend to move out from their normal hiding place when the water is high. This actually makes it easier to catch them sometimes because you can tell where they are hiding out by reading the river. Let you lure drift across and around obstacles in the water like rocks etc because that’s where the fish are going to be hiding. The water flow is a lot less work for the fish and your lure will sail past and present itself the same way as natural bait does in high water. Another thing you need to consider is the knot you use to attach the lure to your line. A normal ‘granny’ knot is not appropriate here because you will end up twisting your line. You won’t notice this straight away but after a day fishing your line will start to tangle and unravel straight off the spool as you cast. Our favorite knot is the Rapala knot. This knot gives your lure plenty of freedom to move about on the line and mimic more of a natural swimming action in the water. If you are using a Mepps lure then I suggest you attach a small lightweight swivel to the line first. This removes the line twisting action and lets the lure run true in the water.